Businesses these days are realising the importance of incorporating content marketing into their B2B strategy and are producing more and more content. Whether you’re already producing a lot of content, or it’s something you want to tentatively dip a toe in, a content calendar helps you structure your content creation and plan exactly what you’re going to do. Seeing all your content at a glance is particularly helpful if you have multiple people involved in the content creation process. A centralised content calendar means anyone can check in on the status of upcoming pieces, and it’s even helpful for team members not involved in producing content to have sight of what’s coming up. A content calendar has a number of positive benefits for your B2B digital marketing strategy. Once you get in the habit of using one, you’ll wonder how you got by before! We’ve got 6 reasons why using a content calendar is a great idea for your business. On a practical level, it’s a big relief to have a content calendar to refer to. Knowing what you’re going to post, and when, takes the stress out of your content marketing strategy. Do you need to do extra research for this content piece, or will another team member need to feed in with some expertise on the topic? Planning content in this way means you can gather all the resources you need ahead of time. If you’re currently coming up with content ideas on the fly, you might not be hitting your objective of what the content would ideally achieve. A content calendar gives you the confidence that your content is feeding directly into the rest of your business strategy. If everyone can see the planned content, it’s easy for other team members to jump in with suggestions and ideas of their own, making sure all areas of the business are represented. Maybe there’s a particular event coming up that your business could link to nicely with some content? You can prepare content to fit in with industry events and important dates, rather than scrambling to produce something timely when the mood strikes. By working to a content calendar, you can ensure that you always have a bank of content at the ready. You’ll be a lot less stressed if content deadlines don’t creep up out of nowhere and surprise you. Hopefully you’re seeing the many benefits of creating a content calendar. So where do you begin? There are endless options available for housing your content calendar and some people like to use an actual calendar application. The main thing is that a content calendar should simplify your processes, not add a new layer of complication. Type of content: is this a blog post, case study, news bulletin…? Date to post: when does this content need to go out? Title of the piece: ideally this will be optimised for SEO. Channel: where will this content appear? Author: who will be writing this content? Written: has the text been finished? Approved: is this approved to publish? Published: has the piece been published yet? There are lots of other headings you could include in your content calendar. You might include a spot for writing your SEO title and meta description if the content is a blog post and will create a new page on your website. You might also like to include a column to highlight the intended audience, or to indicate what the CTA (call to action) should be for the piece of content - but there’s no need to overcomplicate it. Choose the headings that make the process easier for you. A column heading that could work for a lot of B2B companies is ‘Business Focus’. If your company has 4 main sectors you serve, and this is the type of future business you would like to attract, your content should reflect these areas somewhat evenly. If you are posting 4 blogs a month, you could aim to have one blog post a month address one of the 4 different client sectors. Adding a dropdown to your content calendar with the sectors you’re aiming for is a great way to focus your content creation on the right audience. How Much Content to Produce? Now that you have the infrastructure, your content calendar will be looking good. You just have to populate it - easy, right?! Think about how often you want to put new content out. You’ll need to be realistic about the resources available to you and what you can manage. It’s tempting to go in all guns blazing and plan 3 blogs every week for the coming quarter, but is it more realistic to plan one a week or one a fortnight? This will depend on your business structure and the other priorities at play. The beauty of a content calendar is that you now know how much content you’re committing to produce. When it comes to choosing the content itself, a great place to start is thinking about upcoming dates and what content would be appropriate to share. 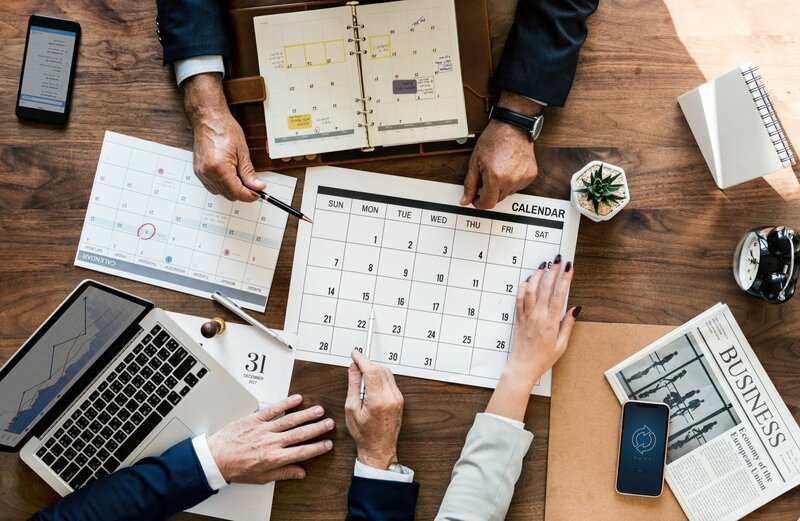 Maybe the end of a calendar year calls for a round up of changes in your industry in the year gone by; other key dates could be when industry-specific events are taking place, or when you’re launching a new product or service. Once you’ve blocked out the content that you’ll definitely want to do for specific dates, you can look at what’s remaining. It can seem easy to fill in content ideas themed around special dates or events. When you come to generating ideas for the remaining blank days, you might find your ideas run a little dry. Your content should always stem from your overarching digital marketing strategy, so if you are ever struggling with topic ideas, think back to your customers and what information would be valuable to them. It’s also great to draw on different areas of expertise in the business to address a broad variety of topics, so the author of each content piece can vary. With a content calendar that your whole team can access, it can even be used to assign topics to different team members. You content calendar can also include the social media posts associated with sharing your content. With lots of options to schedule social media posts in advance, you can even have a bank of posts ready to go. It’s great to be prepared and that’s what a content calendar is all about; just remember that it also pays to be agile and responsive. If something crops up that wasn’t in the original content calendar, there’s no law to say that you can’t create some content around it. Putting a shape on your content marketing allows you to see it in the big picture of your digital marketing strategy. If you need advice on your digital marketing strategy, contact our team to discuss how we can help. Why 0% Bounce Rate Is not Good News!